This entry was posted in Portfolio and tagged QFAL.MI, QFARE.MI, QFARI.MI, QFDI.MI, QFEI1.MI, QFID.MI, QFIMM.MI, QFSEC.MI, QFSOC.MI, QFUNO.MI, QFVIG.MI on March 11, 2019 by Alpha Vulture. Two years ago I bought a basket of Italian real estate funds with a simple thesis: they are all liquidating (because they all have a fixed end date) and they are trading at a big discount to net asset value. Since then that thesis has been playing out slowly. Back then there were a total of 24 funds with a total net asset value of €4.0 billion. Thanks to asset sales (and also some write-downs) there are now 21 funds remaining with a total asset value of €2.6 billion. The total market valuation is €1.4 billion for an overall discount of 46%, down just slightly compared to the 48% discount two years ago. While the overall discount has remained roughly constant there have been some significant shifts between individual funds. 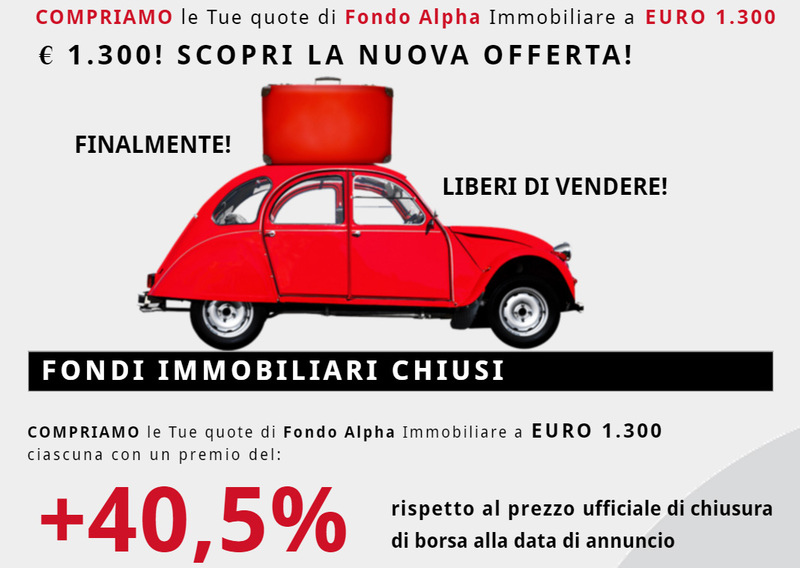 I bought for example Europa Immobiliare N1 at a 54% discount, but thanks to some successful asset sales the discount is down to 14% (pro-forma for a large liquidation dividend that will be paid next month). Other stocks have seen their discount grow. Two years ago I thought that the Atlantic 1 fund was richly valued at a discount of just 24%, now it’s actually one of the cheapest funds with a 58% discount. I have strongly considered adding this one to my basket, but so far the relative high leverage (50% LTV) has been holding me back. I did decide to sell Europa Immobiliare N1 though, and added a couple of other positions. A new addition to my basket is Amundi RE Italia. They haven’t made a lot of progress with liquidating so far and incurred some asset write-downs, but the discount is huge at 61%. My other additions are Securfondo and Socrate. Securfondo has been making good progress with liquidating and has only one building remaining, while Socrate also started with selling assets. A great site to keep track of what is happening in this sector of the market is this one. It’s Italian, but it keep track of asset sales, financial reports and other developments related to these funds. This entry was posted in Portfolio and tagged QFAL.MI, QFARE.MI, QFARI.MI, QFDI.MI, QFEI1.MI, QFID.MI, QFIMM.MI, QFSEC.MI, QFSOC.MI, QFVIG.MI on March 27, 2017 by Alpha Vulture. Elliott Associates announced today that it would accept all shares that were tendered in the offers launched for Fondo Alpha and Immobiliare Dinamico, despite getting less than 50% of the outstanding shares of the two fonds. The tender offer for Fondo Alpha was the biggest success, and Elliott Associates managed to acquire 24.8% of the outstanding shares for a total consideration of €33.5 million. In the Immobiliare Dinamico offer just 2.5% of the outstanding shares were tendered for a total value of €2.8 million, but together with open market purchases they managed to get a total stake of 4.9%. In the offer for the Polis fund that closed a month earlier they acquired 16% of the outstanding shares. I didn’t sell my shares in the offer, and based on today’s market reaction that seems to have been a good choice. Fondo Alpha is now trading 3% above Elliott’s offer while Immobiliare Dinamico is trading 0.2% above the offer. This entry was posted in Portfolio and tagged QFAL.MI, QFID.MI on August 25, 2016 by Alpha Vulture. This entry was posted in Portfolio and tagged QFAL.MI, QFDI.MI, QFID.MI, QFMRA.MI, QFMRB.MI, QFPOL.MI on July 22, 2016 by Alpha Vulture. Elliott Associates, one of the worlds most successful hedge funds, has launched a bid to acquire the share capital of four Italian REIFs. Last year I spend some time analyzing this sector, and decided to buy a basket of seven different funds. I found these attractive because the funds all trade at large discounts to NAV (often >50%) while they are all liquidating and returning capital to shareholders to coming years. It’s good to see that a big and successful hedge fund is apparently seeing the same value, and has launched a bid for four funds. Elliott Associates is offering roughly a 25% premium compared to the undisturbed market price, and the big question is of course should I be happy with this and tender my shares or should I keep my position? Elliott Associates is obviously expecting to generate “adequate” returns even at a 25% premium, and I’m pretty sure that what they consider adequate is also good enough for me. On the other hand I also could just take the money now, and try to reinvest it in one of the many other attractive looking Italian REIFs. A third angle to consider is whether or not a position is warranted just to play the merger arbitrage game. The current spread between the market price and the offer is roughly 6% which is pretty nice. The biggest issue is that Elliott Associates will only accepted tendered shares if they are able to acquire more than 50% of the outstanding share capital, and I have no idea how to handicap the odds of that happening. I can imagine that many shareholders, like myself, aren’t exactly jumping at the opportunity to sell those funds at a 40 or 50% discount to NAV. What do you think the wisest course of action is here? I think I’m currently leaning towards keeping my positions, and just letting things play out till the funds liquidate. Author is long QFAL.MI, QFID.MI and various other iREIFs. This entry was posted in Portfolio and tagged QFAL.MI, QFID.MI, QFMRA.MI, QFMRB.MI, QFPOL.MI on May 20, 2016 by Alpha Vulture.